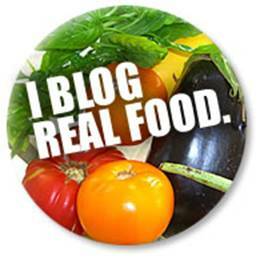 I blog real food with The W.H.O.L.E. Gang… and some drunken chicken! Today, I have the wonderful privilege of sharing one of my recipes on Diane Eblin’s amazing blog, “The W.H.O.L.E. Gang”. I was so honored when she asked if I would like to be a part of the 30 Days To A Food Revolution, an event that she felt inspired to create after watching Jamie Oliver’s Food Revolution and his efforts to change the way America’s children eat. Diane’s goal was to create a resource for people looking to make a difference after following Jamie Oliver’s show. She wanted to help people that were looking for a way to re-evaluate their diets in an attempt to, as she says, “shift from processed foods or unhealthy foods to the foods that our bodies need and love”. And what started as 30 days, 30 food bloggers, 30 ways to eat REAL food, has had such a wonderful response, that she has now extended it! Please go and check out my tip and the reasonfor my own passion on today’s 30 Days To A Food Revolution entry! 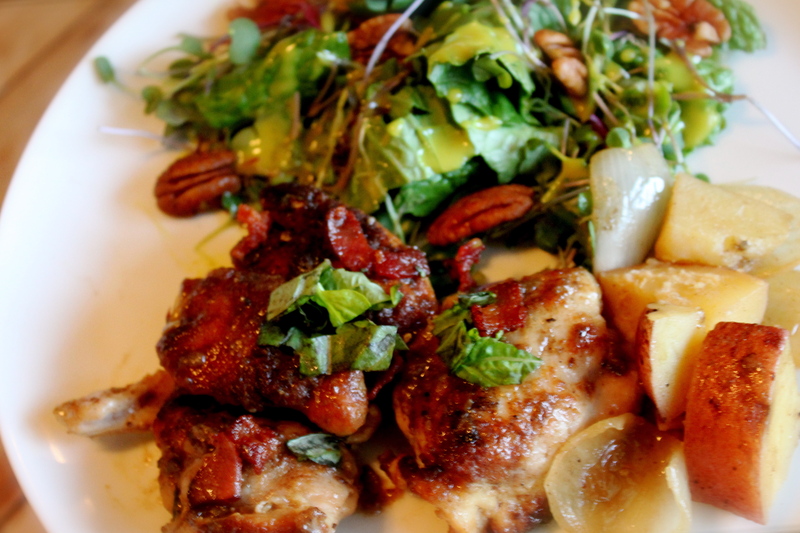 The recipe that I included for the Revolution is my take on Drunken Chicken (Farmer’s Market Style). I have listed it here as well, for easy reference for the future. 2. Season chicken all over with salt and pepper. 3. Heat oil in a heavy 5-quart Dutch oven over medium high heat. Add the bacon and cook until browned, about 5 minutes. Remove with a slotted spoon and transfer to a plate lined with paper towels. 4. Add the olive oil to the drippings and brown chicken in the Dutch oven turning once, about 5 minutes total. Will most likely have to do it in batches so you do not over-crowd the pan (add a little more olive oil, if necessary). Transfer chicken as it is done to a plate and set aside. 5. Add onions and cook until soft and golden, 5 to 6 minutes. Add garlic, carrots, artichoke hearts, mushrooms, and potatoes and cook for a few minutes more, until they start to caramelize and brown a bit. 6. Add wine (or beer) and deglaze the pan with it by scraping off all of the delicious browned bits. Then add chicken stock, rosemary, basil and bay leaf and stir well. 7. Return chicken, along with any accumulated juices, to the Dutch oven and spoon vegetable mixture over the tops of the chicken. Cover and transfer to the oven. 8. Cook until chicken is tender, about 1 hour. Remove bay leaf from pot. 9. Spoon chicken, with its vegetables and sauce, over the brown rice or quinoa and serve garnished with green onions. Wow, that looks so very good, Kim! You’re part of the revolution—cool! Of course, I knew you were, but it’s fun to have you join in at Diane’s. 🙂 I love the quote from your neighbor. The older I get, the less I tend to measure. So I have to be conscious of that fact when I am making a recipe for my blog. Anyway, great recipe … now off to Diane’s to read your tips. Thanks, Shirley! Your comments always make me feel so good! Your support is so appreciated!! I, too, have to pay attention when I am writing recipes. Otherwise, I just like to get creative when I am cooking. I love my neighbor’s motto! It works for her, for sure! The things that come out of her kitchen are AMAZING!!! My mouth is watering Kim!! Yum, yum, yum. I think my husband almost licked the computer screen, LOL! Thanks Heidi!! ;0) Kurt’s favorite way is when I make it with beer instead of wine! Saw your cake! AMAZING! What a great job! Luke is a lucky boy! i made this over the weekend for some friends, and we all LOVED it!! I used boneless skinless chicken thighs and simmered it on the stove only. I had to leave the mushrooms and artis out (my husband is averse, strange being that he is!). This will definitely be a keeper at our house, winter comfort food!! Thank you Kim!